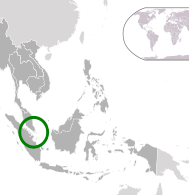 Singapore is a southeast Asian city-state off the southern tip of the Malay Peninsula, an island country approximately 137 kilometres north of the equator. It is made up of 63 islands. The main island has a total land area of 682 square km. Singapore has a tropical rainforest climate with no distinctive seasons, uniform temperature and pressure, high humidity, and abundant rainfall. Temperatures usually range from 23 to 32 °C (73 to 90 °F). April and May are the hottest months, with the wetter monsoon season from November to January. From July to October, there is often haze caused by bush fires in neighbouring Indonesia. Owing to its huge immigrant population America has a very varied cuisine from anywhere to , fried chicken, pizzas, hamburgers, hot dogs, apple pie to Indian cuisine from all over India to Chinese foods. Americans usually prefer pastas and fast foods, many fast foods joints Strabucks , Mcdonalds , Subway , KFC all originated from US. Singapore is a very diverse and young country. It has many languages, cultures and religions for a country its size. Due to the many different languages and cultures in the country, there is no single set of culturally acceptable behaviours. Foreigners also make up 42% of the population and have a strong influence on Singaporean culture. A.T. Kearney named Singapore the most globalised country in the world in 2006 in its Globalization Index. The Economist Intelligence Unit in its "Quality-of-Life Index" ranks Singapore as having the best quality of life in Asia and eleventh overall in the world. The diversity of food is touted as a reason to visit the country, and the variety of food representing different ethnicities is seen by the government as a symbol of its multiculturalism. The "national fruit" of Singapore is the durian. In popular culture, food items belong to a particular ethnicity, with Chinese, Indian, and Malay food clearly defined. The diversity of cuisine has been increased further by the "hybridization" of different styles.